In his 7th match Luigi Delneri booked his first victory. Already on Thursday the team was in Lombardia to prepare themselves for the match. The last position in standings should be left as soon as possible. In the 39th minute Andrea Bertolacci scored the only goal with a great volley in the far corner. In the 2nd half Atalanta did everything to score the equalizer, but Sebastian Frey was unbeatable today. Next week against Chievo we have to miss both Moretti (2 yellow cards today) and Borriello (yellow today), but this doesn’t matter at the moment: with these 3 points Genoa is on the 16th position in the standings, 1 point above the relegation-area. 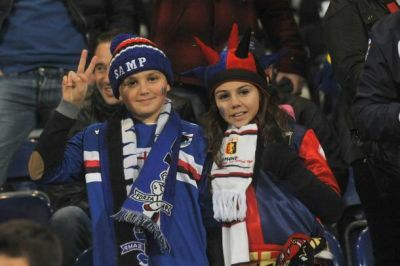 After 7 defeats in a row of Sampdoria and 5 defeats after each other of Genoa, but teams hoped to realize at least a draw in the derby. After 16 minutes Poli opened the score. At the moment Genoa was the best team in the field and the equalizer was expected, Cesare Bovo scored in our own goal: 2-0. In the 2nd half it was again Genoa that was the strongest team, so the goal of Immobile in front of Gradinata Nord wasn’t a surprise. Of course the team of Delneri also did everything to score the deserved equalizer, but 1 counterattack of Sampdoria gave them the deciding goal: 3-1. 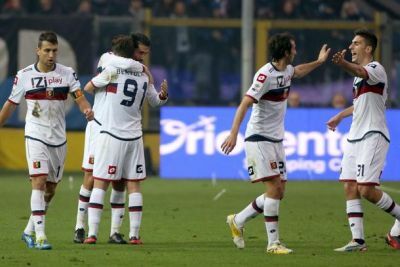 After 90 minutes the score was 2-2 between the friends of Genoa and Napoli. Unfortunately the Azzurri scored twice in injurytime. Ciro Immobile opened the score in the 24th minute and with the 1-0 advantage the first half ended. After 9 minutes in the 2nd half our ex-midfieldplayer Mesto scored the equalizer. Within 2 minutes Genoa again took the lead by Bertolacci. After this goal Napoli beame stronger which lead to the 2-2 equalizer of Cavani in the 79th minute. An honest draw, but in injurytime Hamsik and Insigne scored twice. Again a defeat for the boys of Delneri, but for the first time with the new trainer we scored twice and played good match, 1 week before the derby. In the hard season last year for sure Andreas Granqvist was one of the less players who always scored a reasonable grade. 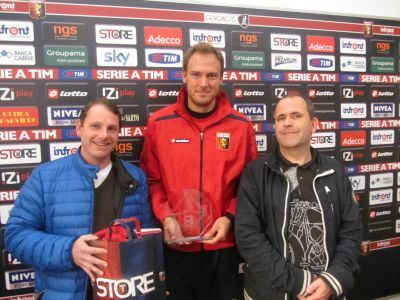 Our Swedish rock was honoured before the last training of the match against Napoli. 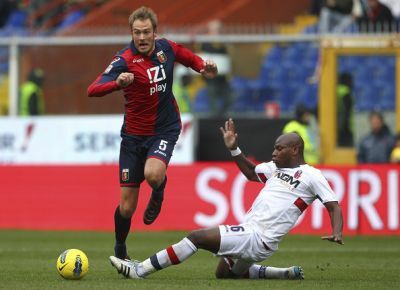 Our last Genoa Club Amsterdam Genoano of the year: Rodrigo Palacio already plays with Inter. Let’s hope very friendly (and good dutch speaking!) Andreas will stay longer with us. Genoa misses Marco Borriello. Without our topscorer it is very hard to score and to play offensive. With Mr. Delneri the defensive part of the team increased a lot, but every match we take 1 goal and lose 1-0. In the homematch against Fiorentina we deserved to loose with more then the only goal of Pasqual in the 14th minute. Goalkeeper Frey saved us several times, but Genoa never was close to a draw. Three days later in Siena we played a typical 0-0 match with less emotions, but Paci headed a corner behind Frey so the hometeam stole the points.